About two lakh people, manly OBCs, gathered at Ahmedabad’s sprawling GMDC grounds – the same spot where the Patels held their massive show four months ago – in a rare display of unity under the banner of Other Backward Class, Scheduled Caste and Scheduled Tribe (OSS) Ekta Manch, telling the BJP government in Gujarat that it could not ignore them. Even as telling the state rulers that they had “failed to do enough” for backward sections, caught under the scourge of illicit liquor and deprivation, what was supposed to be a Vyasan Mukti (addiction free) rally, which converted into an OBC show of strength. Sending out a strong message to the state BJP government under Anandiben Patel, leaders at the OSS Ekta Manch suggested, they, like Patels, were also is an important vote bank, can cannot be ignored. The rally was interpreted as a parallel to create a political space for OBCs, while like Patels, who, held their rally on August 25, 2015, demanding reservation quota in government jobs. The rally triggered the first massive electoral setback to the BJP in at the local body elections in year in Gujarat. Already, the OSS Ekta Manch is being described as a counter to the high-caste Patel community organization, Patidar Anamat Andkolan Samiti. Its leader, Alpesh Thakore, is in his 30s. Patel caste leader Hardik Patel is in his 20s. “This rally in the prelude”, Alpesh Thakore, whose Thakore Ekta Sena is active among Gujarat’s rural hinterlands, declared. Former foot-soldiers during the British rule who consider themselves Kshatriyas, Thakores are the biggest of all the OBC groups in Gujarat. 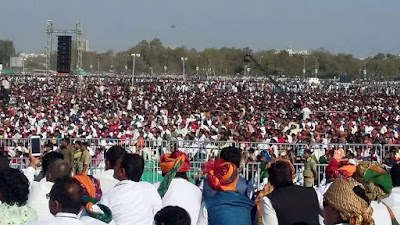 The rally, in which majority of participants was Thakores, found its support from sections of other OBC communities as well, especially Kolis, and was joined by representatives of Dalit and tribals. Analysts say, through this rally, Alpesh Thakore is seeking to occupy the same space among OBCs which Hardik Patel created among Patels. “A new socio-political order appears to be emerging in Gujarat, a voice that political parties in Gujarat can ill-afford to ignore”, opines Gujarat-based sociologist Vidyut Joshi. Predicts social scientist Achyut Yagnik, both young leaders have a long way to go, as they have still not been sullied by personal political ambitions, and their support base genuine. 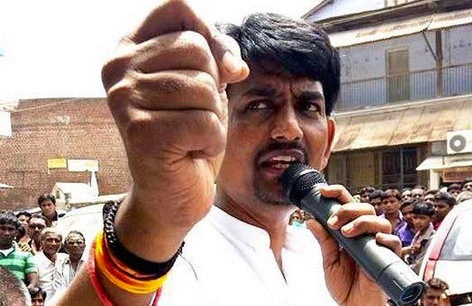 “We are not with either of the two political parties, BJP or Congress, we wish progress for OBCs,” said Alpesh Thakore during his little more than half-an-hour speech. He read out a paper containing a pledge, which he took from the audience: That they would fight for de-addiction and come together to create a socio-economic power, which successive rulers did not care about. “If we are able to create a social space by developing health and education facilities among OBCs, backing it up with de-addiction, no one will be able to ignore us”, Thakore said, adding, “This is important, if are not to allow any political party in Gujarat to ignore us. It is a clarion call… This is my message to Gujarat’s politicians…”, even as drawing a huge applause. BJP leader should learn from this new commers.Liquor prohibition is jock with people of gujarat.Liquor trafficing in rail train without any hegitation.Parelol economy grow in south gujarat due to liquor business.BJP leaders,workers,mla,mp shut down their eyes,mind and heart against it thats why Alpesh Thalor,Hardik type people risen.Peoples are more wise then them.Pls awaeken yourself or ready for defeat.